Lindsay Hill’s exquisite debut novel, Sea of Hooks, has become an unexpected phenomenon, hitting the Best of 2013 lists compiled by Publishers Weekly, New York magazine, and the Oregonian. Although Sea of Hooks was just published in November by McPherson & Company, it’s already in its second printing. The novel explores the nature of memory through a series of fragmented scenes about protagonist Christopher Westall, whose youth, marked by a fierce and vibrant imagination, and his trip to Bhutan after his mother’s suicide, form parallel narrative tracks through this rich, complicated, and stunningly beautiful book. Within these two tracks, Christopher returns to certain memories over and over, finding new insights into the patterns and relationships he’s yearning to decipher, including his collection of “messengers,” street debris that he brings home to study. Christopher’s relationship with his mother forms the emotional core of the book, and Lindsay improvises on the theme of brokenness, what it means to each of his characters, and how Christopher feels he must shield his own flaws from his mother or be relegated to the broken pile. To connect the pieces, and to create a frame for the whole of this particular life he’s rendering on the page, Lindsay offers titles for each of the fragments, some of them repeating to keep us grounded and to remind us that this, over here, connects with that. It’s a remarkable, unusual, and very effective structure. Lindsay braids those long memory threads together with new ones, as the story progresses and Christopher goes from child to teen, and from teen to young man, searching for a different sort of meaning on his trip to Bhutan. It’s philosophical, breathtaking, and heartbreaking, a book to sink into and soak up, a book to savor, sentence by sentence, fragment by fragment. Lindsay will be reading from Sea of Hooks in Portland, Oregon, at 7 p.m. on Thursday, Jan. 23, at Glyph Cafe and Arts Space, 33 NW Park Ave.
I’m so honored and grateful for the chance to interview one of the most talked-about authors of 2013. Welcome to the Seven Questions Series, Lindsay! 1. Tell us about Sea of Hooks. 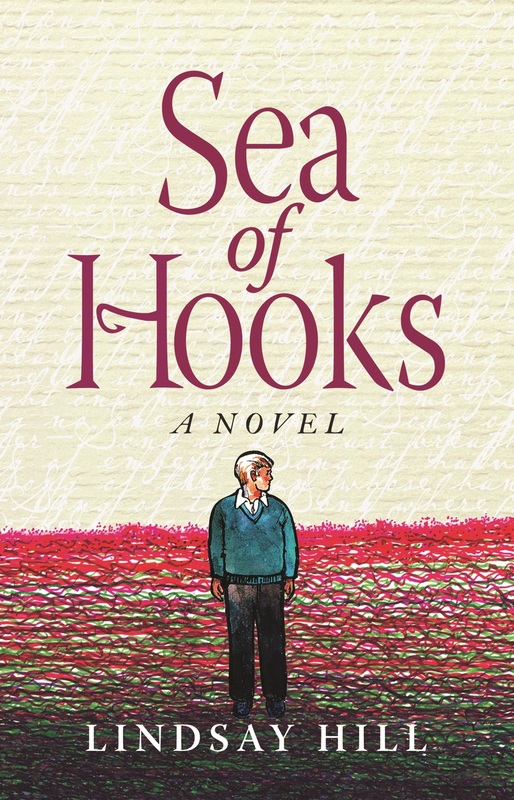 Sea of Hooks is the story of Christopher Westall, a sensitive and imaginative boy growing up in San Francisco in the ’50s, ’60s, and early ’70s. Christopher can’t read or learn like other kids and he lives between the everyday world, of going to school and living with his parents, a world he calls The World of Days and Weeks, and a mystical world of hints and hidden meanings that he calls The Wonder Ocean. Christopher accesses The Wonder Ocean when he tries to read and also through bits of debris he finds blowing down the streets, debris within which he finds “messages.” He holds these two worlds in tenuous balance until traumas upend this equilibrium and shatter his life into fragments. The story follows the dual narratives of Christopher’s travels in Bhutan, and the events that lead him to journey to the remote Himalayan kingdom. He goes in search of answers to the mysteries of his childhood and a way to reassemble his broken world. 2. I understand you worked on this novel for two decades. Where did you start, in terms of your original concept, and how similar or different was that initial idea from the final manuscript? I’d like to have had a well-developed “original concept,” but I’m afraid the book’s origins are more chaotic than that. The writing began with journaling during a trip to Bhutan in 1994. At that time I was in my early forties, working at a bank, and, with my wife Nita, raising our two small children in Memphis. I’d only written and published poetry at that point. The trip, as in the novel, included a good deal of cultural and spiritual education and we were exposed to the Terma Tradition of the Nyingma sect of Tibetan Buddhism. Terma are concealed spiritual treasures scattered across the landscape, and meant to be discovered, at an appropriate time, by adepts called Tertons, or “treasure-finders.” I was completely enthralled with the idea that sacred objects were concealed among us, awaiting their moment of discovery by those with a gift for finding them. Ten days after my return, with my wife’s complete support, I resigned from the bank, stating that I had decided to write a novel. I had no idea what I had undertaken. I continued journaling for hundreds of pages with only the vague idea that I would write a novel about a banker who goes to Bhutan and is transformed by what he learns there. Numerous false starts petered out after a few dozen pages. Eventually, I started typing my various thoughts in the small, titled, fragments that now comprise the book. It was not until 2003 that I wrote what became the first “section” of the book, entitled “Glass.” At this point I had written 750 pages, virtually all of which would be discarded as the book took an entirely new direction. Over the coming years the sections, which grew in number to over 5,000, began to take shape and the central characters of the book were formed along with the principle components of the plot. So, initially, the book was not intended to be the story that it became. The Terma Tradition did remain, as did the story of the central character’s transformative journey to Bhutan. 3. In Sea of Hooks, you’ve created this smart and unusual weave, where each fragmented scene in the novel connects to other fragments, but not necessarily the ones that come right before or after. And yet despite those jumps, the story progresses in an orderly, chronological fashion, following two prominent threads in Christopher’s life: his experiences growing up, and his travels through Bhutan. It feels to me like a really organic experience of a character’s memories and how those memories have shaped his identity. Did you experiment with other structures before settling on this one? As you suspect, the structure grew organically. Images—their continuity, disruption and rhyming—guided the work as much as plot and character development. The fragmentary structure disrupts the narrative, usually in service to expanding an image or other thematic component, but also to emulate the ways in which The Wonder Ocean erupts into Christopher’s thinking. So, the structure mirrors one of the major themes of the work: that the parts of a shattered world, a shattered heart, can, with diligence, be made whole again. This theme also shows up in Christopher’s collecting his bits of debris from the streets, into which he constructs his “City of Messengers.” As you point out, Christopher’s identity is shaped through these interwoven fragments. The book’s structure also serves to give the reader access to Christopher’s experience of assembling himself. Once the work was underway, I didn’t considered other structures, and I’m not sure that another structure would have been possible for me. This is so because the book was just arriving as a continuum of fragments. 4. When did you decide you were done with your novel and ready to send it out? Was there anything in particular that prompted you to call it complete? The novel was not actually finished until a year after it was accepted. McPherson accepted what I thought was a final draft, but there was still much to be done to bring it to its final form. But, to speak more directly to your question, I would say that I had entered into a relationship with the work, and I was “listening” to it intently. I had developed a deep habit of letting the work tell me where it wanted to go, what it wanted thrown out, and what it wanted to have developed more. So, the completion came in four stages: I realized that I had written all the material that I needed to write or could write, then I had to edit it down, essentially a rewrite by excision, then I had to refine, organize, connect, and “polish” the work that survived the cut. Finally, Bruce McPherson offered several key suggestions that opened some opportunities to strengthen the book considerably. At a certain point, on the phone with Bruce, we both determined that Sea of Hooks was finished. 5. You’re a published poet, and I love novels by poets, because the language is always so considered and intentional. In Sea of Hooks, each word is essential to the sentence, and each sentence is essential to the paragraph. Was your writing process for these scenes similar to or different from how you approach writing a poem? I was also wondering, as I read, whether ordering the fragments was similar to organizing poems in a collection. I subvocalize every word when I read, so the sounds of words—the concussive qualities of their juxtapositions—their spoken rhythms—are with me when I write prose. So, though it’s not an expectation of the reader in any way, Sea of Hooks was written to be read aloud. Clearly, this is a characteristic of poetry, which, in my experience, demands to be read aloud in order to be truly heard. So, the language of Sea of Hooks, as you realized, reflects values often associated with poems. Also, my last two books of poetry, Contango and The Empty Quarter, were both book-length poems. Over my writing life, I’ve been drawn more and more to longer forms. In almost all of my writing I work as a collagist: putting discreet components of my writing together in combinations to form, hopefully, a coherent whole. Many of the individual “sections” did arrive like poems—single, self-sufficient units of expression. However, the project was very different from assembling a poetry collection. This was so not only because of scale, but because the sections had to interact as deeply interconnected parts of an extended narrative—had to include not only music and images, but the deeper motivations of characters, their actions, and the themes the book wanted to express. 6. You’ve received an unbelievable amount of attention for this debut novel, an immense outpouring of appreciation from the literary establishment, including Sea of Hooks being named one of 2013’s ten best books by Publishers’ Weekly. That’s the dream of every debut novelist. What’s it like? It’s been wonderful, and a bit destabilizing, especially for a poet used to flying well below the radar! Of course, I’m delighted with the book’s reception, especially so because my publisher, McPherson & Co. was willing to take a chance with it. 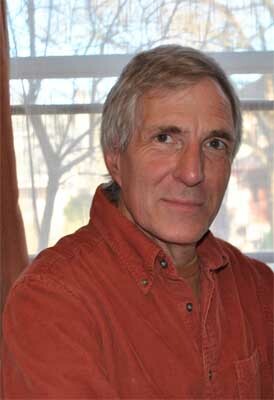 Bruce McPherson is a courageous editor who, for the last three decades, has published non-mainstream fiction that he believes in. I’m very grateful that he believed in Sea of Hooks and that, at least to some degree, that belief has been vindicated. I’m also very grateful to readers who’ve been willing to commit their reading time to a work that can be both structurally and emotionally demanding. I also hope that the book’s relative success will contribute to the already increasing attention being given to books by independent publishers, and encourage writers, working at the edges of visibility, to persist. 7. Do you have any advice for authors who have been working on their debut novels for years? Well, I certainly wouldn’t advise anyone to follow in the footsteps of a writer who took two decades to produce a single novel! Find the beginning. Find the “catalytic” moment, the true beginning. I wrote for a long time before I found the real beginning of my story. “Listen” to the manuscript, and let it “kick out” what doesn’t work. Maintain a continuous relationship with writing. I carried scraps of paper and small notebooks with me everywhere and wrote down anything that came along that caught my attention. I did this casually, joyfully, without expectation that the writing was “good,” or that it would eventually be used. This habit of just staying available, staying in contact with the work kept the writing flowing. To the degree possible, (mentally and temporally), separate the writing function from the editing function. At least for me, trying to edit while writing (other than the natural editing that takes place with little effort), can lead to blocking the flow and constricting the imaginative possibilities hidden in the work. This means that when you are writing, just write, write with some abandon, don’t insist that you write “well,” and make room for the unexpected to happen. Then, after some passage of time, go back and see what’s there, go back and edit. Don’t just write the book, write about the book. I had a separate file, called my “structure” file, with thoughts about the plot, the characters, the sequencing, and the voice. This allowed me to brainstorm lots of possible directions and write the ones that fired my imagination. This separate work on “structure,” was instrumental in my bringing the book to a close. Find Sea of Hooks at Powell’s or Amazon. Learn more about McPherson & Co. at the publisher’s website. Read the Publishers Weekly piece naming Sea of Hooks one of the ten best books of 2013. And here’s what Jeff Baker of The Oregonian had to say when naming Sea of Hooks the #1 book of 2013 in the paper’s end-of-year wrapup. Thanks so much for participating in the Seven Questions Series, Lindsay! And special thanks to publicist Mary Bisbee-Beek for setting up this phenomenal opportunity. This entry was posted in Books, Seven Questions, Writing and tagged author interview, best book of 2013, fragmented novel, Laura Stanfill, Lindsay Hill, literary fiction, Sea of Hooks. Bookmark the permalink. Excellent interview of an intriguing writer. I will look for his book to see what the excitement is all about! It sounds like a fascinating book. Thanks so much for the interview!